Jacob’s are best known for Cream Crackers, with 1.4 billion consumed in 2013. The business was founded in Ireland, but this post explores the history of their British subsidiary. W&R Jacob was founded by two Quaker brothers, William and Robert, in Waterford, Ireland in 1851. Shortly afterwards the firm relocated to Peter’s Row, Dublin. A fire completely destroyed their factory in 1880. The firm completely rebuilt and extended the site, and installed new machinery. W&R Jacob had introduced “American Crackers” by 1881. W&R Jacob introduced the cream cracker in 1885. The new product was to quickly prove a great success. W&R Jacob acquired ten acres of land at Aintree, adjacent to Hartley’s jam factory, in 1912. It was intended to improve the firm’s market share in Liverpool. Manufacture began on the site from 1914. During the First World War the armed forces were supplied with Jacob’s biscuits. Following the end of the First World War, Jacob’s rehired every employee who had fought during the war, and also found work for a large number of men who had been injured during the conflict. The foundation of the Irish Free State saw the English subsidiary established as an independent company in 1922. The Aintree factory covered 30 spacious acres by 1932, and included lawns and flower beds. The firm employed over 3,000 people. Over 300 different varieties of biscuit were manufactured. The Yorkshire market was entered in earnest from 1932, with the construction of a large depot in Leeds. Approximately 1,500 employees were engaged in manufacturing in 1949; 75 percent of them were women. A new depot was established at Plympton in 1959, due to increasing sales in the Devon and Cornwall region. It had a capacity to handle six million lbs (2.7 million kg) of biscuits each year. Jacob’s was the third largest biscuit manufacturer in Britain when it was acquired by Associated Biscuits in 1960. Family members, who controlled 70 percent of voting shares, approved the sale. Associated Biscuits dedicated the vast majority of its advertising expenditure to the strong Jacob’s brand from 1972. The Jacob’s sweet biscuit product lines, other than the Club, were phased out in the 1980s in favour of the Huntley & Palmer brand. The Aintree site employed 2,800 people by 1983. The Huntley & Palmer name was discontinued in 1990, and all products were relabelled under the Jacob’s brand. United Biscuits acquired Associated Biscuits for £200 million in 2004. United Biscuits rebranded all of its savoury biscuits under the Jacob’s name from 2014. 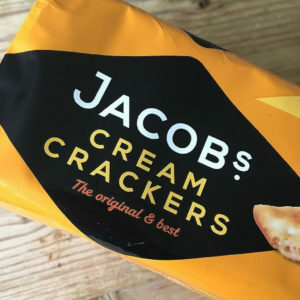 Jacob’s gained the Mini Cheddars product, but lines such as Club, Fig Rolls, BN and Iced Gems were rebranded as McVitie’s. The Aintree site produced over 55,000 tonnes of products in 2014. 900 people were employed at the factory. It was announced that the Aintree site would receive an investment of £10 million in 2015. The site is the centre of United Biscuits savoury snack production, and brands manufactured include Twiglets, Mini Cheddars and Club, as well as Jacob’s. Jacob’s holds 25 percent of the British savoury biscuit market as of 2015.